No matter where you live in the world, if you’re interested in edtech, you’ve probably heard of The International Society for Technology in Education (ISTE). ISTE is a non-profit organization that serves educators interested in technology in education. The annual ISTE Conference and Expo is the biggest educational technology conference in the world, attracting over 16,000 attendees. It’s held annually in different US locations. ISTE 2018 is being held on June 24-27 in Chicago. Living around 10,000 miles (16,000 km) from Chicago, I won’t be attending this year but I’ve learned from Sue Waters and others that there are many ways to participate in the conference remotely! This post explains 10+ ways that you can attend ISTE virtually (for free!) wherever you are in the world. Don’t have time to read the post? Check out our summary poster below. Print it off and scan the QR codes with the camera of your phone or tablet to go directly to some of the resources. The NotAtISTE Google+ Community is certainly the first place you should visit if you’re interested attending ISTE remotely. It’s an amazing community set up and facilitated by Jen Wagner, Peggy George, and Vicky Sedgwick. Social networking is an important part of attending conferences. The Google+ Community is a fun way for those #NotAtISTE to connect with each other while sharing learning and tips. Each year, the #NotAtISTE community organizes a wide range of activities. Daily events/conversations/etc which you can participate in (with randomly drawn door prizes!). Flipgrid (this has been added as a new way for the community to connect in 2018). #NotAtISTE Ignite sessions where you can share an idea in under 5 minutes. Check out the sessions on offer. Community members also create their own badges, ribbons, and t-shirts. You can create your own badge using these templates. Tip: click on tutorials to find video explanations of how to make these. Periscope is a live streaming app that allows whoever is watching live on their mobile device to comment and ask questions. Best of all, you can watch it after it is recorded if you miss the live broadcast. Periscope has been an excellent way to watch presentations, visit the exhibit hall, and attend poster sessions remotely for the past few years. To see an example, check out Tony Vincent’s Live Broadcasts from ISTE 2016. Read how Sue Waters has used Flipboard and Tweetdeck to watch out for the latest Periscope broadcasts in her #NotAtISTE 2015 post. The Team from #PassTheScopeEDU will be periscoping from ISTE and you can follow their hashtag on Twitter or read more on the Pass The Scope EDU site. Last year, well known educational blogger Shelly Terrell brought her baby girl, Savvy, to help interview people at ISTE. 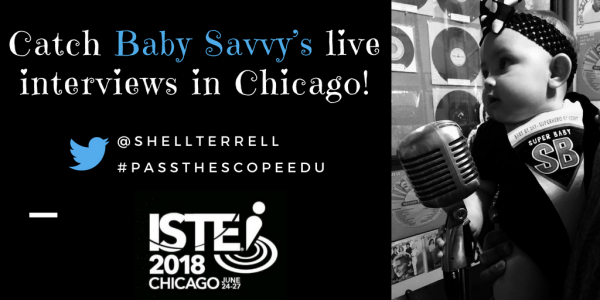 They’re doing it again this year and you will find the interviews on Shelly’s blog and on Twitter (@ShellTerrell and via the #PassthescopeEDU hashtag). Read more about this on Shelly’s blog. She’s also looking for people who are happy to be interviewed if you’ll be in Chicago. Voxer is an app that allows users to send audio, text messages, and photos to each other. Voxer allows you to interact either synchronous and asynchronous. 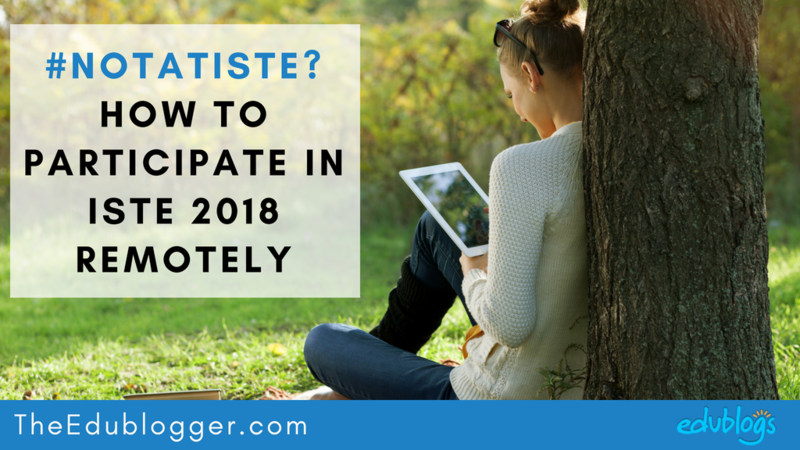 This is ideal for the #NotAtISTE community as participants are spread across all time zones. You can join the #NotAtISTE Voxer community by clicking on this link. Watch this video to learn how to use Voxer. 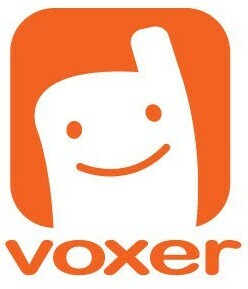 You’ll find more information on using Voxer in education here. Twitter is one of the best ways to monitor what’s happening at ISTE thanks to the large number of educators tweeting from the conference. The same hashtags are also being used on Instagram. The official Twitter handle is @ISTE. Flipboard — Used to monitor content shared when you’re offline (asynchronous). You’ll find a complete step by step guide to setting up Flipboard here. TweetDeck — Used to monitor content shared when online (synchronous). You’ll find a complete step by step guide to using Twitter and following hashtags using Tweetdeck here. 🐦 Catch more of the tweets from #ISTE18 in Chicago by saving a search that contains multiple hashtags. Abbe Waldron is compiling a list of those participating in #NotAtISTE. Click here to find the list and click on subscribe to follow tweets from this community. 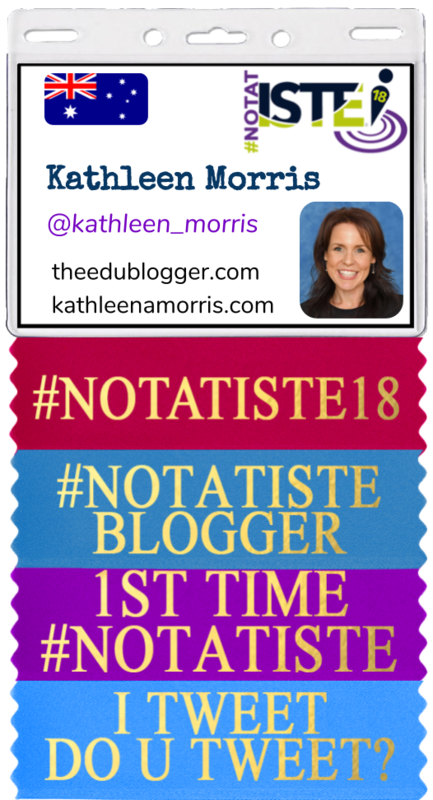 If you’re #NotAtISTE this year and would like to be included in the list, send Abbe a tweet (@AbbeWaldron) or add your details on the map in the #NotAtISTE Google + Community (it’s in the introductions area). You might also be interested in setting up your own Twitter list. For example, you could create a list of the presenters you’re interested in following. Read more about using Twitter lists. Peggie George, Barbara Tallent, and Susie Highley are curating resources into a #NotAtISTE18 LiveBinder. 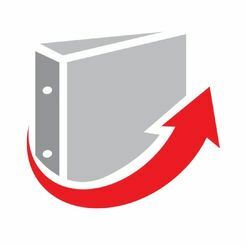 Check out the 2018 LiveBinder. 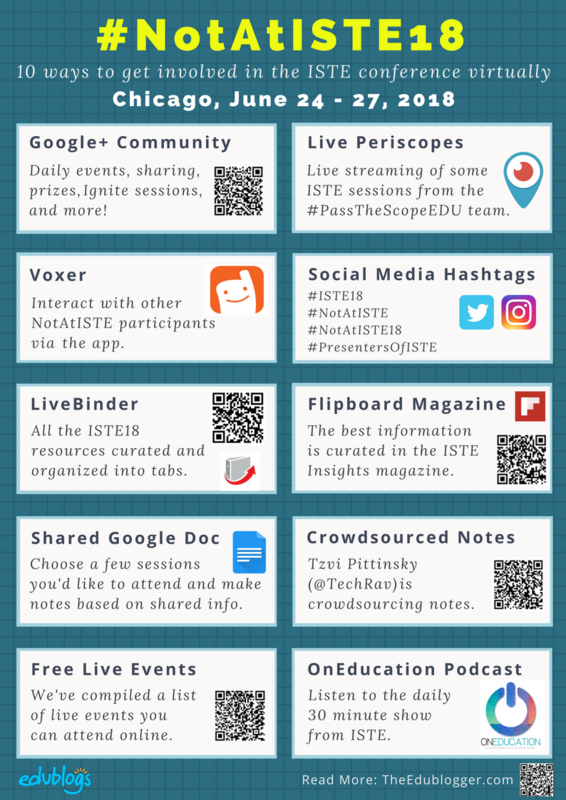 Bookmark it, pin it, and keep checking back as it gets curated all throughout the ISTE lead up and conference. Start with the “Getting Started” tab. You’re welcome to share resources with the ISTE hashtags and the team will add them to the LiveBinder. Since 2014, Sue Waters and others have been curating the best information and content shared during the conference into the ISTE Insights Flipboard magazine. I’m looking forward to assisting the team with this curation this year! This video explains how Sue uses Flipboard to find, curate and share content. You’ll find a complete step by step guide to setting up Flipboard here. Following in Sue’s footsteps, I am setting up a Google Doc this year with notes on some of the sessions I’d love to attend. With over 1000 sessions available, this is far from an exhaustive list. I favorited over 20 sessions in my ISTE account and have decided to write notes on 10 of these. You can check out the progress of my Google Doc here! Sessions I’ve chosen are based around blogging, online tools, digital writing etc. Here is the process Sue has followed in previous years if you want to make your own document. The example images are from 2017. 1. Work out which sessions you would have attended if you were at ISTE by searching the conference program by title. If you log into the ISTE website you can mark your favorite sessions. When you’re logged in, you’ll also have access to a ‘digital tote’ where you can store all your conference materials like session handouts and resource lists. Here’s an example of a session page. 2. Check each session page for links to the presentation website, handouts etc. and use these to write notes about the session. Click on “Add to digital tote” to store all session handouts, resource lists, exhibitor information, and more for easy access. 3. 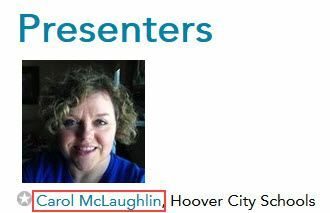 Check each of the presenter’s profiles by clicking on their name to see if they include their Twitter username or links to their website. On Carol’s presenter’s details page she has included her Twitter username. 4. Transfer information about each session you would have liked to attend into a Google Doc including links to the ISTE session page, presenter’s Twitter usernames (or websites), and a summary of the session. Below is an example of what it looks like from Sue’s Google Doc. 5. Before the session, add any additional notes by checking the presenters’ resources, websites, and Twitter accounts. 6. After the session, check if anyone is tweeting information about the presentation by checking the presenter’s Twitter accounts. Work through any relevant information shared. For example, the Tweet embedded below takes you to the presenters’ resources which Sue worked through as she wrote her notes. You can check out how Sue added her own reflections and notes in her shared Google Doc for ISTE 2017. Sue has been collaborating with Tzvi Pittinsky to help crowdsource notes shared at ISTE since 2014. In 2015, Tzvi and Sue presented at ISTE on using Crowdsourcing in the Classroom based on what they learned from the process in 2014. Tzvi is crowdsourcing again this year. Click here to find the Google Sheet where you can view and add notes. A number of groups and brands have organised events that people who are #NotAtISTE can attend for free. We have compiled this in a Google Doc and will update it if more information becomes available. Click here to open the Google Doc in a new tab. 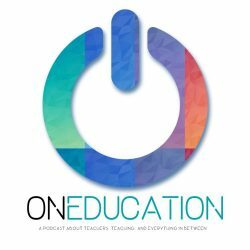 OnEducation Podcast is a popular new edtech podcast by educators, Mike and Glen. They will be doing a daily 30 minute special edition podcast from ISTE from Saturday 24th to Wednesday 27th June. The podcasts will include discussions on the sessions as well as interviews with presenters, attendees, vendors, and ISTE executives. You can subscribe here on Apple Podcasts or search in your podcasting app. Teacher and edtech leader Tony Vincent is using a curation tool called Wakelet to curate some of the great information he comes across while participating in the ISTE conference. Take a look at Tony’s collection, or create your own. There is so much content shared during ISTE, and so many activities you can join as a #NotAtISTE participant. It can feel overwhelming and lead to information overload! My most important tip is don’t place a time limit on your learning! People often feel that they have a set time to achieve what they are trying to learn based on the duration of a conference. I take the opposite approach attending conferences virtually. I break what I want to learn into manageable chunks and focus on what I want to learn before the conference starts, during the conference and after the conference finishes. I also break up activities based on what needs to be done synchronously vs what I can do asynchronously. I accept that with a conference like ISTE, even as a NOTAtISTE participant, it’s impossible to participate in everything so I prioritize what I do based on achieving the maximum outcome for the time I have available. Before the conference — Organize your Google Doc by working through the ISTE program and the resources shared by presenters while also researching different options for participating as a NOTAtISTE participant. During the conference — Participate in the different NotAtISTE communities, curate resources into Flipboard, and focus on any synchronous activities I want to learn or participate in. My goal is to try one or two new things I haven’t tried previously. For example, in the NotAtISTE community in 2014 I learned how to use Voxer and in 2015 I was introduced to Periscope. Add notes to my Google Docs. After the conference — Work through the resources that have been shared and continue to research topics that interest me. Numerous participants at ISTE and NotAtISTE will curate the best links which makes it easy to follow them up after the conference. Time wise, I look for ways I can multitask to work smarter and not harder. For example, with Voxer and Periscope I can listen on my daily walks or when I’m doing work around the house. Have any more ideas? Please leave them in the comments below! Hi, Is there a way to benefit from the conferences although time has passed? There definitely is! You might like to check out the LiveBinder as all the resources that were shared at ISTE have been curated there. Have a browse and you’re sure to find something you’d like to learn about — there are links to Periscope video records, presenters’ slides, blog posts and more. Looking for some great new ideas to use in my computer class and STEM classrooms! Thank you! Thanks! I can’t wait to hear what’s happening! Thank you! I will definitely be utilizing a few of these! That’s great! Excitement is high for ISTE already on social media as you would have seen. I’m sure #NotAtISTE will be fun! Thanks a bunch this is amazing as I too #NotAtISTE so …. I’m #NotAtISTE, so this helps a lot, thank you! Fantastic! Thanks for letting us know. Hope you learn lots from the #NotAtISTE community! Have fun learning from ISTE, Tiziana!